As today is the first day of the school Christmas holidays, I thought that I would share some a recipe for Christmas Cupcakes which are great to make with the kids in preparation for Christmas. Eldest and I recently had great fun making these cakes and she really enjoyed decorating them - so not quite up to professional standards but fun to make and delicious all the same! The recipe comes from the Primrose Bakery who have a lovely recipe book which I received for Christmas a couple of years ago. Line a 12 hole muffin tray with cupcake cases and pre-heat the oven to 160 (fan) or 180 degrees. Using an electric hand mixer or alternative, cream the butter and sugar in a large mixing bowl for around 3 to 5 minutes until the mixture is smooth. Add the eggs one at a time and mix for a few minutes after each one. In a separate bowl, combine the two flours. Place the milk and vanilla extract into a jug and stir together. Add one third of the flour to the butter and sugar creamed mixture and beat well. Pour in one third of the milk and beat again. Continue to repeat this until all of the flour and milk has been added. Carefully spoon the mixture into the cupcake cases and fill them to around two-thirds full. Bake in the oven for 25 minutes until the cakes are slightly raised and golden brown. Insert a skewer to check whether the cakes are cooked - this should come out clean. Remove from the oven and leave the cakes in their tins for about 10 minutes before placing on a wire rack to cool. Once cooled, they are ready for icing. With an electric hand mixer or equivalent, beat together the butter, milk, vanilla extract and half the icing sugar in a large mixing bowl until smooth. Gradually add the remainder of the icing sugar and beat together again until the buttercream is smooth and creamy. 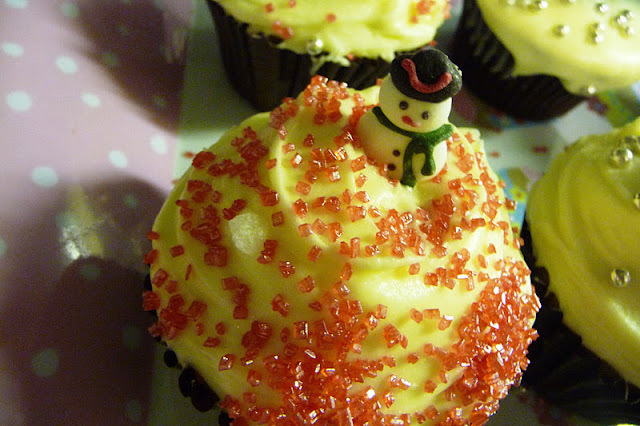 Decorate with the Christmas decorations, leave to set and then serve. Thanks Sophie! - I took a look at your veggie blog too - looks really good!